It's Time to Feel Confident, Complete Your Homework Quickly, and Finally Understand What You Are Doing In Algebra! If you are completely frustrated in math class, feel more lost each and every day, or feel like you will never understand Algebra, then I have the perfect solution for you! Before Algebra-class was born, I was a teacher for 10 years! So, I know exactly how you are feeling. I've seen the frustrated faces and I spent many hours after school helping students who just couldn't get it. Algebra is not an easy subject to grasp for many students and as my daughter says, "It's like learning a foreign language". I'm sure that's how it feels for many students! BUT...just because it's not easy or because it feels like a foreign language doesn't mean that you can't conquer it!! How Can You Conquer Algebra? With the right instruction, you can make sense of Algebra and conquer it! Most likely, you are struggling because you have a bunch of formulas and processes that you need to memorize in order to solve your problems. It's impossible to keep it all straight and remember each process! That's not the best way to learn. Instead, you must understand each individual concept, why it works, and how they all work together. When you understand what you are doing, it makes sense, and there's no memorization needed! That's how I'm going to teach you! I've broken every concept down into bite size pieces that make sense! When you pull all these bite size pieces together you understand each process from beginning to end. This eliminates the frustrations and builds confidence, which is just what you need! So... How Can Algebra Class Help You Make Sense of Algebra? With step-by-step videos that walk you through over 420 examples, you will have no problems understanding that foreign language that we call Algebra! You will have access to thousands of practice problems and NO, you don't have to complete all of them! I am a 38 year old mother of five who has never done mathematics in high school. I am considering a career change so I need mathematics desperately. In my attempts to learn high school math. You have taken away my frustration and made learning math very easy and fun for me. For me, your course explains even better than one of the high school teachers whose services I had acquired to help with my studies. I literally came from one of his classes crying, thinking that I had become so dumb that I could not comprehend a thing in what he was trying to explain. I am learning from home now without any math tutor. I love math. You are a great teacher. Thank you very much. You can have access to the hundreds of Algebra lessons in Algebra Class (for a full year) for the same exact price that you would pay for just one hour of tutoring. YES, for just $49.99 you can have access to the entire program. 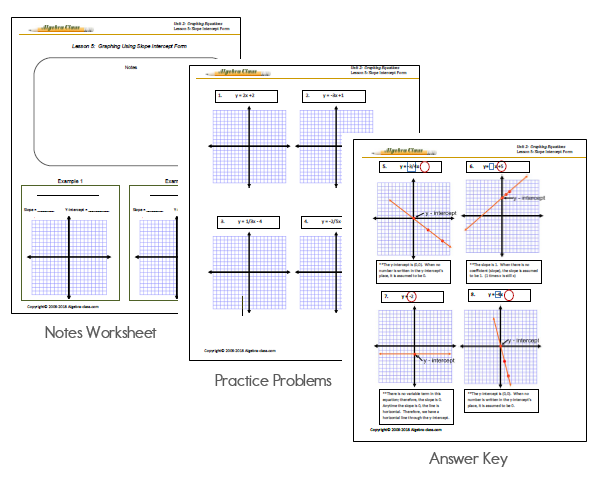 As a BONUS, I've also included the first five units of the Algebra 2 program. Algebra 2 is currently a work in progress and lessons will be added as they are completed. If you know that you will only need the program for a few months, I also offer a monthly subscription of $9.99 per month. If you are like me, I don't like to buy anything unless I give it a try first. I like to see what it is all about before I invest time or money into it. So, I'm going to give you 2 free units! This way, you can try it out, see if it works for you and make sure my videos don't put you to sleep! That's right, all you have to do is choose a user name and password and you will have instant access to the entire Algebra Class curriculum! There is absolutely nothing that you have to download! It can't get much easier! What if I want to cancel my monthly subscription? You can login to your pay pal account at any time to cancel your automatic payments. Once you login, go to Profile and then My Money then click update on My Pre approved Payments. Here you can cancel your automatic payment to Algebra Class. Are you studying Algebra for a short period of time? You can sign up for just $9.99 per month. This charge will be a recurring charge every month until the subscription is cancelled.